The cultural center of Etterbeek Le Senghor invites KOJO to give workshops to kids between 6 and 12 years old. The workshops will take place between 20 and 24 august 2018. 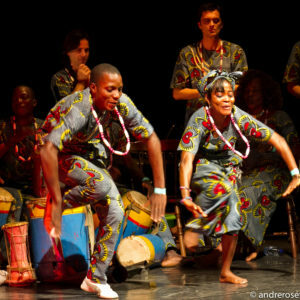 The percussionist-dancers-singers of KOJO team up with Mâäk players Laurent Blondiau and Michel Massot to let the kids discover African rhythms through the Vodun-culture from Benin. Visit the website for more info. The workshops will be given in French!